Canada’s dim sum capital is bursting with bite-size Chinese delicacies. At some spots, servers wheel carts laden with bamboo steamers, as in the old country – though menu service is increasingly the norm. Michelin Man-like sausage rolls and pan-fried pork buns compliment exacting traditional fare in this laid-back, modern-looking spot. 5016 Centre St. N.E., 403-731-9199. Tea Pot China Bistro and Café H.K. At this swanky hotspot, once-cranky waiters have changed their ways, genially serving up stellar classics like siu mai (pork and shrimp bean curd wrap) and har gao (shrimp dumplings). Unit 100, 9650 Harvest Hills Boulevard N.E., 403-532-3982. Legend has it the proprietors, the Wong family, invented ginger beef, a Western-Chinese standard. Narrow, noisy and cheerful, the restaurant draws long lineups. Try the high-rise fry cart for savory turnip cake, shrimp pepper wedges. 106 Third Ave. S.E., 403-264-5326. Pass an informal Hong Kong celebrity portrait gallery as you enter an old-school, no-frills room. 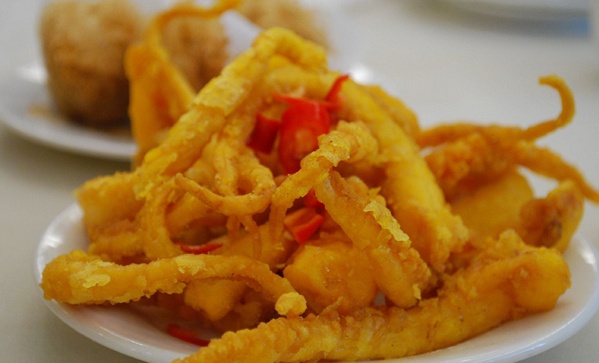 If you don’t see it on a cart, ask for deep-fried squid tentacles. 183M-1623 Centre St. N., 403-230-7800. This busy, efficient hangar-sized restaurant is great for groups. As for food, three words: fried onion cakes. Sticky rice and stuffed rice crepes are also exceptional. Order using cart service, self-serve steam tables or – our favourite – the fry counter. 328 Centre St. S., 403-777-2288. Intimate and crowded, U&Me overlooks Centre Street in Chinatown. Bee-looking dumplings are tasty shrimp balls striped with nori. Strolling waiters offer custard tarts and more. 201-233 Centre St. S.W., 403-264-5988.